This tutorial provides you with a foundation for working with the Adobe Photoshop workspace. It is the first lesson in the Adobe Photoshop CC Digital Classroom book. For more Adobe Photoshop training options, visit AGI’s Photoshop Classes. In this lesson, you’ll learn how to use the Adobe Photoshop CC work area efficiently. You will also discover how to open a document using Adobe Bridge, use the Tools panel, and easily navigate through images. Before starting this lesson, make sure that your tools and panels are at the Photoshop CC default settings by resetting your preferences. See “Resetting Adobe Photoshop CC preferences” in the Starting up section of this book. You will work with several files from the ps01lessons folder in this lesson. Make sure that you have loaded the pslessons folder onto your hard drive that are included with this book or available for download if you purchased the digital version of the book. See “Loading lesson files” in the Starting up section of this book. Adobe Photoshop is an image-editing program that can open an image stored on your system, captured by a scanner, digital camera, phone, tablet device, or downloaded from the Web. It can also open captured video images and vector illustrations. In addition, you can create new documents in Photoshop. The documents that you create or edit in Photoshop are typically created from pixels, but can also include vector graphics. Vector graphics can be enlarged or reduced in size with no loss of clarity. In this lesson, you will discover how to open existing files in Adobe Photoshop using a feature called Mini Bridge. In addition to many other helpful options, Mini Bridge allows you to see details about your file before opening it in Photoshop. Although Adobe Bridge is available and works with all the applications in the Creative Cloud, it might not be installed on your system. 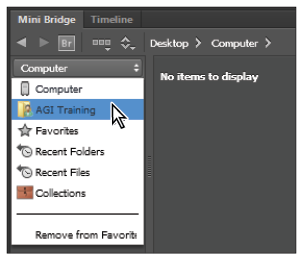 Keep in mind that you must have Adobe Bridge installed to use both Adobe Bridge and Mini-Bridge. You can check your Programs folder (Windows) or Applications folder (Mac) to see if Adobe Bridge CC is installed. If it is not, launch the Adobe Application Manager and select to install it from the Creative Cloud. Don’t fret if you forget to do this. If you access Adobe Bridge from any application, and don’t have it installed, you will automatically be taken to the Adobe Application Manager. Mini Bridge works like the stand-alone Adobe Bridge application, but exists as a panel in Photoshop. You can access Mini Bridge by choosing File > Browse in Mini Bridge. 1 Launch Adobe Photoshop CC and choose File > Browse in Mini Bridge; Mini Bridge appears as a panel across the bottom of the workspace. If a message appears indicating that “Bridge must be running to browse files,” click Launch Bridge. If you are launching Bridge for the first time, you might be asked to enable application-specific extensions in Bridge; select “Yes”. The first time Adobe Bridge launches, it could be slow because it is caching the files that it is preparing to display. Even though you will be instructed to use Adobe Bridge throughout the lessons in this book, you can choose to use Mini Bridge. 2 From the drop-down menu in the navigation pod on the left side of Mini Bridge, select your User name. You now see personal folders that you can navigate to, such as Desktop, Documents, and Pictures. 3 Double-click Desktop to see the folders on your desktop appear in the Navigation pod, including the pslessons folder that you downloaded or dragged to the desktop from the DVD. If you do not see your folder on the Desktop, verify that you didn’t save your folder to the Desktop of another User. if it is not immediately visible. 4 Double-click the pslessons folder to reveal the contents, and then click ps01lessons. 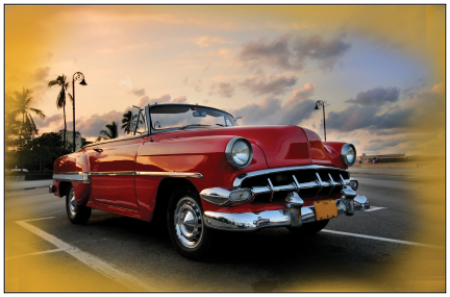 The Mini Bridge now displays three images of an antique car in the folder. 5 Locate and double-click to open the file named ps0101_done.psd. 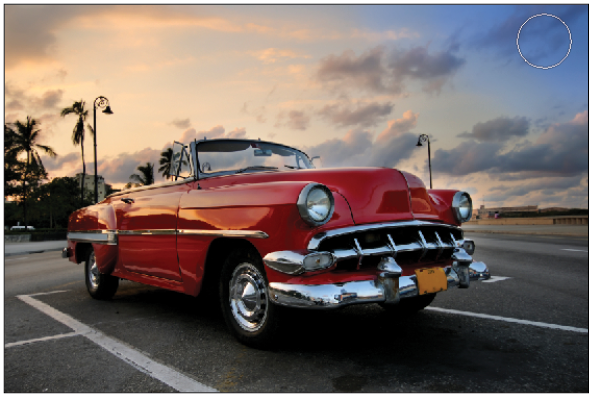 An image of an antique car appears. This is the finished project. You can keep it open as you work or close it once you have examined the file. 6 Open the file named ps0101.psd, which is the starting file used for this lesson. Choose File > Save As to open the Save As dialog box. 7 Navigate to the ps01lessons folder. In the File name, or Save as text field, type ps0101_work, and choose Photoshop from the Format drop-down menu. Click Save. 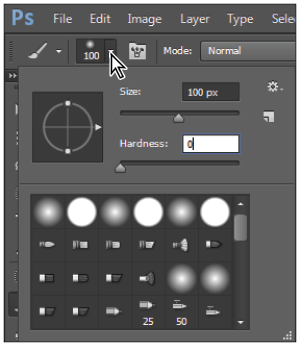 When you start Photoshop, the Tools panel appears docked on the left side of the screen—by default, it is docked on the left side of the workspace. 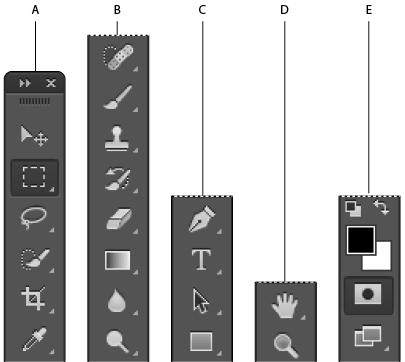 There are four main groups of tools separated by functionality on the Tools panel: selection, cropping, and measuring; retouching and painting; drawing and type; and navigation. At the bottom of the Tools panel, you find Set foreground color and Set background color, as well as Quick Mask. You can create a floating Tools panel by clicking the dark gray title bar at the top of the Tools panel and then dragging it to a new location. You can dock it again by dragging it back to the left side of the workspace; release when you see the blue vertical bar appear. Can’t tell the tools apart? You can view tooltips that reveal a tool’s name and keyboard shortcut by positioning your cursor over the tool. The Tools panel is in a space-saving, one-column format. Click the double-arrows in the gray title bar area above the Tools panel to bring the Tools panel into the two-column view. Click the double-arrows again to bring the Tools panel back to the default, single-column view. Keep the Tools panel set to whichever format works best for you. With the selection of most tools comes the opportunity to change options. In this exercise, you will have the opportunity to use the Brush tool and change its options to become even more powerful. 1 With the ps0101_work.psd image open, select the Brush tool ( ). Look in the Options bar to see a variety of options you can change. A. Brush Preset Picker. B. Painting Mode. C. Opacity. D. Flow. E. Airbrush. F. Pressure. 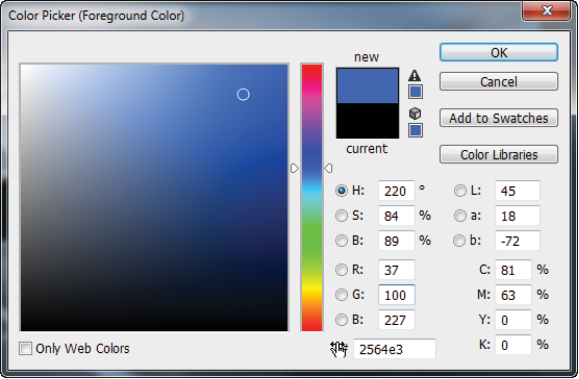 Using the Color Picker, you can select a blue color that you will use to brighten up the sky. 3 In the Color Picker, click once on the section of the Color Slider that contains blue hues, and then choose a bright blue color from the large Color Pane. In our example, we pick a color that is created R: 37, Green: 100, B: 227. Click OK.
Keep in mind that, depending upon the destination of your image, you might not be able to achieve the same color of blue that you see in the screen. Lesson 5, “Painting and Retouching,” discusses color and how to use it in your images, in more detail. 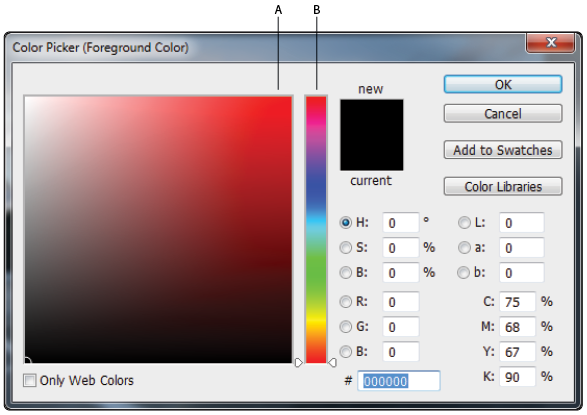 Select the paint blending mode named Color, and change the Opacity to 20%. 11 Notice that you can build up the color by releasing the paint brush and painting over the same area. If you make a mistake, choose Edit > Undo, or press Ctrl+Z (Windows) or Command+Z (Mac OS) to undo.